This multi-volume set, published by International Seismic Application Technology (ISAT) provides in-depth solutions for enhancing the seismic resiliency of critical distributed utilities within essential facilities and other structures. The ISAT Manuals depict an extensive array of engineered seismic restraint assemblies for common utility conditions including specific hardware components and the anchorage designs for connection to structure. All solutions are IBC code complaint and meet or exceed the design requirements of IBC code reference document ASCE 7, “Minimum Design Loads for Buildings and Other Structures”. The industries most extensive assemblage of seismic restraint installation details. Pre-engineered bracing tables for all major pipe sizes, conduit sizes and an extensive range of trapeze rack weights. Code required Special Inspection requirements. Domestic Hot and Cold Water, Sanitary Sewer Lines, Roof Drain Leaders, Fuel Gas, Medical Gas, Process Piping and Fire Protection Piping. 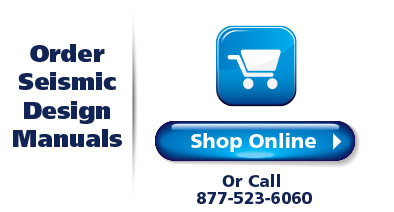 Shop Now from ISAT's Secure Online Store or call 877-523-6060.